What an incredible hunting season we have had with family and great friends, and what a way to wrap it up today. 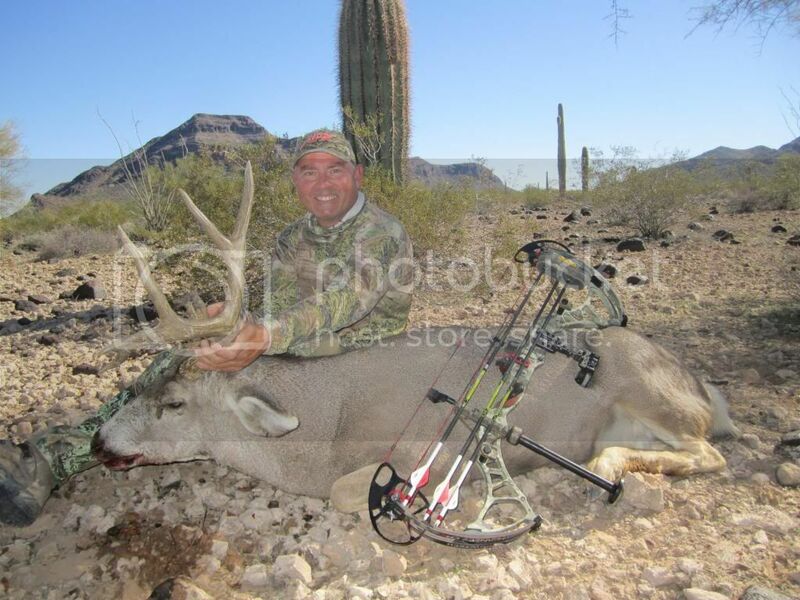 This was our last go at the Arizona late archery season this weekend. A huge thanks to wifeys sis for coming up and staying with us and taking care of our daughter both days so that wifey and I could get after it hard! Yesterday wifey was up and was close to bucks a few times, one at a mere 10 feet! Today I got to get after it. We had planned to hunt for a few hours, then head back and break camp and head for home. We hiked up our first knob to glass from to look for some of the deer from yesterday. We couldn't find any of them so my eyes started wandering farther and farther away. I was glassing in to a valley that we found yesterday and could see a lone deer walking across a malapai flat. We later measured how far it was away at over 3.5 miles! We relocated to a much closer knob, I found the deer within a few minutes and I was off and running. He had hooked up with a few does also. It took me a few hours to get in range. As I was sneaking in close I bumped a couple of the does up out of bed. I was watching them and I caught movement over to my left, and guess who stands up at 20 yds! I went to pull back but he busted out to where the does were.......I was lip squeaking like crazy and he stopped at what I guessed 60 flat. I was already drawn by then and put it in the 10 ring! He expired within 50 yards. He's a big 5 on his left with a cool crab claw front. Right side is broken off right where it started to fork. Both eye guards are broke off. He was an old BRAWLER!!! Center of his skull to outside his left side is 14 1/2". He was a solid 28"+ buck in tact, and we will enjoy every ounce of the meat!!! Unreal end to our season! Nice buck man good job ! You know I'm loving that bomber you shot Davy! You guys hit it more than hard this season, and deserve that warrior of a deer! Nice one Dave. Man if he only matched. Great Job! Chap, it would have been cool, but I dig the character the way he is. He was a brawler for sure! no matter how you look at it.....he was a old friqqin fightn bruiser....being there looking at him on the ground and all his scares, cut up ears....he was a old fighter....ya would of been cool if he was still intact....bottom line bro you killed a desert toad in a TOUGH unit to do it in.....awesome buck broski glad I was there to share it with ya bro!!!!
" the one that wins gets the other guys antler" LOL!!!!!!! What a weird coincidence you both shot bucks with that type of rack or lack there of. Pretty cool.